Puppies open their eyes at about 7 – 10 days of age. In Shar-Pei, this is often when the first symptoms of entropion appear. Typically the puppies open their eyes, but quickly they begin squinting and closing them. Often there is a mucous eye discharge and these puppies usually don’t eat well or gain weight like their littermates. 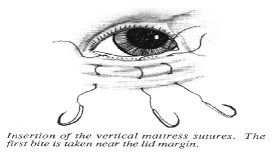 EYE TACKING is a temporary measure in which sutures (stitches) are placed in the eye lids to roll the lids “out” of the eyeball. Often this can be done without anesthesia in very young puppies (2-4 weeks of age). Sometimes gas anesthesia is used. 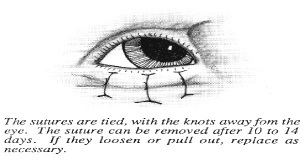 Nylon sutures are placed in the eyelids which opens the eyes. I usually use 4-0 nylon with a small cutting needle like a CS-1). Often an antibiotic eye ointment is dispensed to help heal any corneal ulcers and prevent secondary bacterial infections.These sutures are left in place for as long as possible – up to 4 weeks in some cases. The tacks can be replaceed as needed until a permanent repair procedure can be done. If the sutures loosen up or are causing problems, they can be removed. 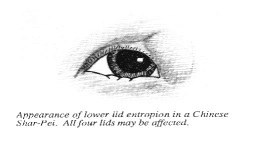 Eye tacking can result in permanent repair of entropion, but its primary goal is to prevent serious eye damage until the pup is old enough to undergo permanent entropion repair – around 6-8 months of age. Puppies who have their eyes tacked may or may not need permanent entropion repair later on – there is not much correlation between the two. ENTROPION IN YOUNG PUPPIES CAN RESULT IN CORNEAL ULCERATION AND IS A MEDICAL EMERGENCY – SEE YOUR VET IMMEDIATELY!